The HARP refinance has been a staple of the U.S. housing market recovery, helping more than 3.3 million homeowners to refinance to lower rates since 2009. Despite persistently low mortgage rates in 2015, though, the number of closings is dropping. Fewer HARP Refinance loans closed in June than during any month in the program’s 5-year history, resulting in the HARP program expiring in 15 months. Why Is The HARP Program Expiring? HARP’s sponsoring agency, the FHFA, believes the slowdown is an issue of “awareness”, which is probably accurate. Consumers frequently tell officials that the program appears “too good to be true” and that it “must be a scam”. HARP is not a scam. It’s real and more than 600,000 U.S. households are “in the money” due to a HARP-refinance. Even with all these consumers in the money, very few new homeowners are actually doing it too. An outreach program has been formed to fill the lack of awareness, which includes mailers and town halls. The Federal Housing Finance Agency wants today’s eligible HARP households to get started on their refinances now. If you’re a current U.S. homeowner and think your mortgage rate is too high for today’s market, it’s a terrific time to take a look at your HARP loan eligibility. HARP expires at the end of next year. What Is The HARP Program In Florida? HARP is an acronym, which stands for Home Affordable Refinance Program. Sometimes called the “Obama Refi”, the HARP program was launched in 2009 as part of that year’s economic stimulus program. At the time, current mortgage rates had been dropping and so were U.S. home values. 30-year fixed-rate mortgage rates had moved to the high-4s, opening refinance opportunities nationwide. Unfortunately, many homeowners, including those in Los Angeles, California; Miami, Florida; and Phoenix, Arizona found themselves unable to refinance. As home values cratered late last decade, many homeowners had too little equity to refinance. That’s when the Home Affordable Refinance Program was first proposed. Through a series of economic stimulus programs, the government promoted the idea that if homeowners who had lost home equity could only get access to a refinance, they could capitalize on low rates and lower their monthly mortgage payments. An increase in household cash flow, consumer spending would get a boost which, the government reasoned, would help propel the U.S. economy into a recovery. When HARP was passed, its guidelines stated that a homeowner’s home equity was irrelevant for purposes of a refinance. So long as the consumer met several basic criteria, including a history of on-time payments, the existing loan would be HARP-eligible for lower mortgage rates. The most popular headline regarding HARP read “Obama Waives Refi Requirements”. The program was an instant hit. When HARP first launched, it was expected to reach 7 million U.S. homeowners. It was clear within the program’s first two years, though, with less than even one million loans closed, that HARP would fail to reach its target. One of the reasons why HARP was falling short was that the government was asking banks to underwrite HARP loans as a streamlined-like refinance, but holding them responsible for whatever due diligence errors a previous lender may have made on the same loan. For example, if Wells Fargo was making a HARP loan to an existing Bank of America customer, Wells Fargo would be accountable to Bank of America’s original home loan approval plus any errors, omissions, or fraud which may occurred on the initial underwrite. This resulted in banks being scared by these rules. To remove the risk of another bank’s “bad underwrite”, then, most lenders chose to restrict HARP loans to their existing customer base only. Loans like these came to be known as “same-servicer” HARP loans. The lack of cross-servicer loans hindered HARP’s progress, suppressing total loan volume. A second reason HARP was falling short was because the program restricted HARP loans to homes with an LTV (Loan to Value) of 125% LTV or less. The LTV restriction prevented homeowners in hard-hit states such as Nevada and Florida from using HARP. This was because many had negative-equity positions greater which exceeded what HARP would allow. 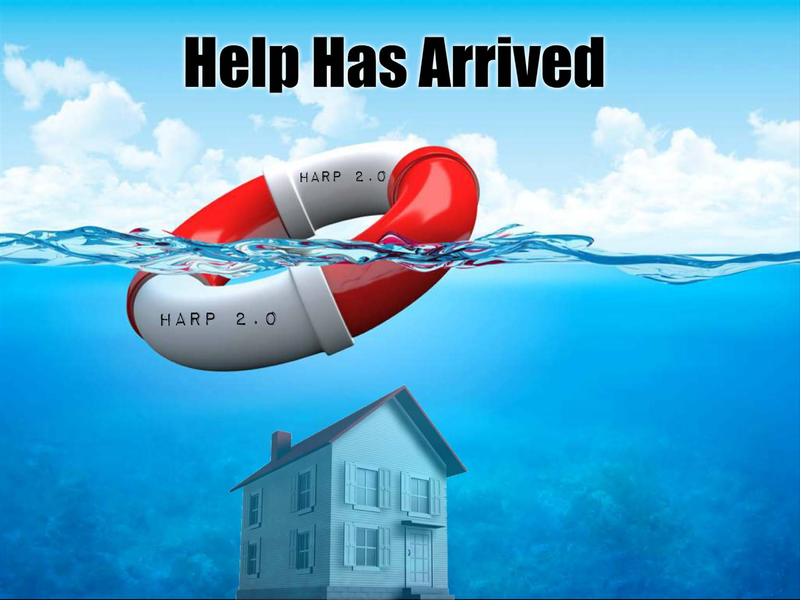 After two-plus years of HARP, then, in an effort to make HARP “better”, the government re-released the Home Affordable Refinance Program as “HARP 2.0“. There were two main changes in HARP’s second release. The first change was that new mortgage lenders were indemnified from errors of the original lender. The second was that all loan-to-value restrictions were removed; 125% LTV was no longer a limit. The changes to HARP gave U.S. homeowners access to unlimited LTV loans, plus every HARP-participating lender. HARP volume tripled in the next 12 months. In HARP 2’s first month, loans with LTVs over 125% accounted for more than 40% of all HARP loans closed. This proved to be a peak and an anomaly; the result of pent-up demand and a rush to use HARP 2. Ultra-high LTV loans represented 25% of all HARP 2 loans in the updated program’s first year. Today, though, loans over 125% LTV account for less than 10 percent of all HARP loans, and that percentage is sinking. As home values have climbed nationwide, as much as 25% in some markets, the need for ultra-high LTV HARP loans over 125% is less. Less than 10% of all HARP loans are for ultra-high LTVs. The U.S. housing market has been strong since 2011 and rising home values have diminished the need for the high-LTV HARP loan. This trend should continue, too, as home values continue to make gains nationwide. The HARP program expires December 31, 2016. There are no plans to extend it. HARP mortgage rates are near all-time lows and the program expires at the end of 2016. If your existing mortgage rate is above today’s rates and your home has lost value since purchase, you may be HARP-eligible immediately. If you are interested in learning more about the HARP 2.0 Program you can contact NSH Mortgage.